As FPV Drone Racing hits the masses through awesome Championships like the Drone Racing League, so does awareness and interest into the hobby. Since DRL's Level 1: Miami Nights Aired last week across the globe thousands and thousands of people have been talking about it, wowed by it, and now want to compete and beat all of the top racers. With that being said, if you google "how to get into drone racing" - you'll be plagued with a million difference pieces of advice, all taking different routes, with different costs - many of which will fall short of your expectations of a drone racing experience and likely put you off for good. I'm hoping this blog post will inform you to make the best decision for how you should get into drone racing, how you can put your time in most efficiently to become a top racer, as well as helpful guidance on where to go where things go wrong - because if you've seen any drone racing videos you'll know we as pilots crash, and crash often! Each one has it's own little advantages and disadvantages to go with it, and for each in mind I'll be recommending products that suit each. Simulators are a great way to get yourself into drone racing - it teaches you the controls and muscle memory for flying drones, without the cost or hassle of fixing and replacing your drone when you smash it. Most simulators allow you to plug in your Radio Transmitter to the computer via USB, so you can use the same controller you would use to fly your drone once you are ready to buy one. I appreciate this is not an avenue everyone would want to take - staring at a computer screen can get boring fast if you play alone, and they also lack that realism. You will also require a pretty well spec'd computer to play such sims, but if you have that the initial investment is a piece of equipment you will need for your drone anyway! However, for learning the muscle memory they are ideal, and initially will get you up in the air and competing the fastest (in my opinion). The DRL simulator is awesome for many reasons, the first and foremost is the fact it is FREE. This makes it stand out above and beyond any other simulator for this reason. It supports various controllers including the FrSky Taranis series (X9D, Q7, Horus), as well as Playstation and Xbox controllers if you don't fancy investing in a radio yet. As for the simulator itself, it actually flies very nicely, and is one of the most accurate ones. The drones on here fly a little differently to the other simulator, as it is hand-tuned to behave just like the "Racer 2" from the DRL 2016 season (as well as you being able to fly all of the competition tracks as seen on TV). That does not matter all that much however because learning the stick movements required can still be done with ease. Personally I think this is my favourite simulator in terms of feel and how the drone behaves compared to a drone in real life. It also has many of the UK, European and even Global tracks that have featured at real life events - so if you fancy competing against some of the pros from your armchair then this is also the place to do it. I've been lucky enough to fly at most of the tracks featured in the sim, so it has some personal touches I like to it. As I mentioned above, in terms of drone feel, this is the most realistic I've personally flown, but it does come with a price (though it is only the same price as a coffee per month). They're becoming one of the most popular Christmas presents due to the range in price, but a small drone is another great way to get into racing. Flying Line of Sight (without goggles or a FPV camera), means that you get to learn to fly a drone from the ground up. 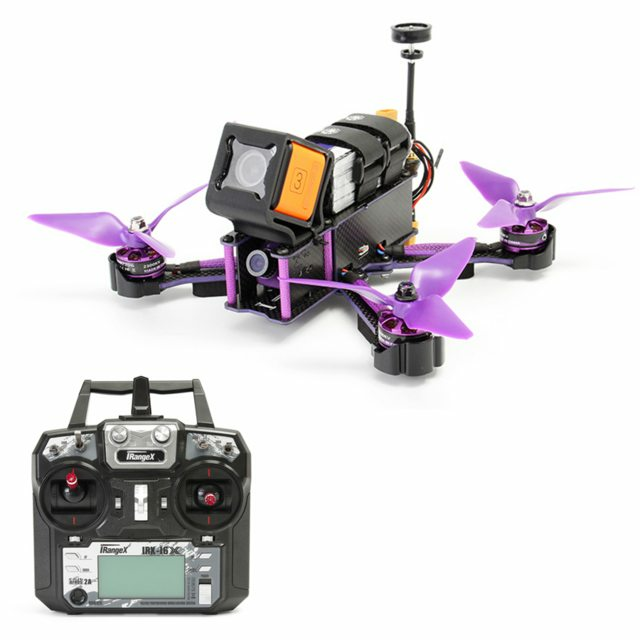 It is harder to master, because as the drone changes orientation so do the controls, but it will also teach you invaluable skills you will likely require even when you do FPV racing. There's such a huge amount of different drones around this price range, but I've chosen one that I have personally flown, and flies well. It also takes a beating (crashing), as well as being an drone that is super easy to get spares as well. This particular drone is very similar (near identical), to the small FPV drone that I'll be recommending in the next stage of the article, except for the fact it has a camera on it. You can if you have the technical ability add a FPV camera and goggles at a later stage, with many guides available on YouTube and RCGroups.com (a huge R/C forum). The advantages of taking this route mean that you can practice indoors without damaging yourself, property or others as well as being able to fly regardless of the weather outside. I'm in the UK, so it is more often than not that we do not get to fly due to poor weather (usually rain :( ). The drone above will come with a single battery, and will require batteries for the transmitter to function, but you can buy more batteries and all the relevant spares here. If you do not mind waiting for it to ship from China, you can even buy the drone at a cheaper price here too :) The only downside with this down is that it comes with auto-level only - meaning that if you take your hands off of the sticks, it will effectively sit in a hovered state (it will still move around due to wind, but it will stay level). 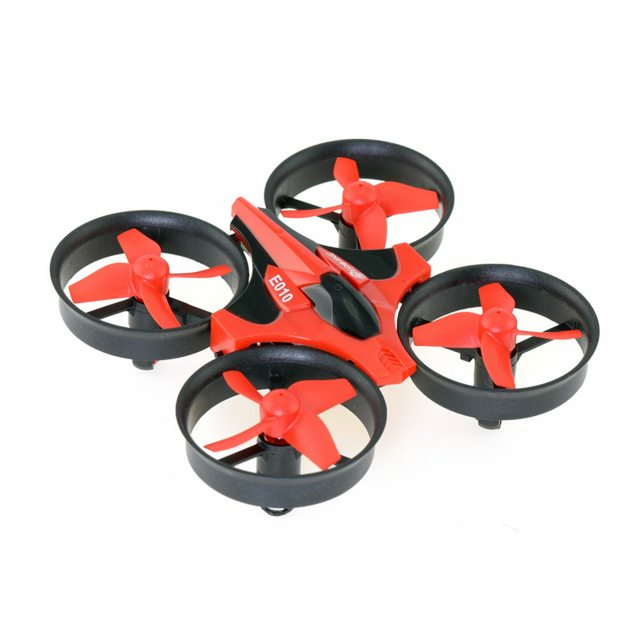 The drone that immediately stands out is the Inductrix FPV. There is a new "Inductrix FPV Pro" - but this is only in "Bind and Fly" form which requires you to purchase your own transmitter and goggles. If you did want to do this then I recommend a Spektrum DX6 and the goggles linked below (Eachine VR D2 Pro). However, this kit comes with everything you need to get into it including drone, batteries, transmitter and FPV screen. The only drawback I would say is the FPV screen - it is far less immersive than any type of goggles, though I know some prefer it. 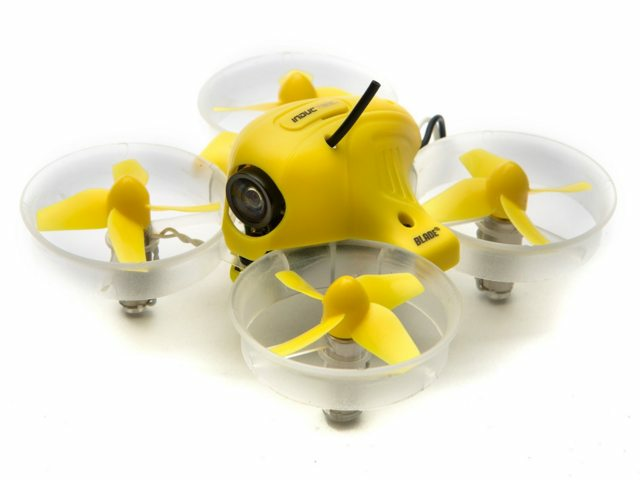 This drone is also available in BNF form (if you search Inductrix BNF) - and you can do exactly the same as above and purchase a transmitter such as a Spektrum DX6, and then pair it with the goggles of your choice. In terms of flying, this is a great little flyer that will teach you the basics just like the LoS one above, but more importantly the basics of FPV. It will allow you to immediately get used to the analog video feed we see, as well as learning the controls without any real risk of damaging it or anything else as they're so small and light. The only disadvantage to this is they can eventually break if you crash from a large height, and they are also not good outdoors unless there is barely any wind. In terms of starting out into FPV with an actual drone though, I would say this is likely the best route. Another advantage of going down this route is that if you use a good transmitter that allows you to go into Acro mode, you can practice the recommended mode for drone racing - though I would highly recommend testing this outdoors - it is pretty difficult on such a small craft indoors, and is actually way less fun than the auto-level mode (on this drone). Now, if you have heard of the TINY WHOOP, then hats off to you - you are already further into the hobby than you realise :) An awesome guy called Jesse Perkins created the TINY WHOOP around a year ago today, by strapping a lightweight FPV camera onto the Inductrix shown above. In fact, it was the sole reason that Horizon Hobby actually started making the FPV Variant, the popularity and interest of it blew up overnight and is one of the most popular Facebook communities for drones on Facebook. 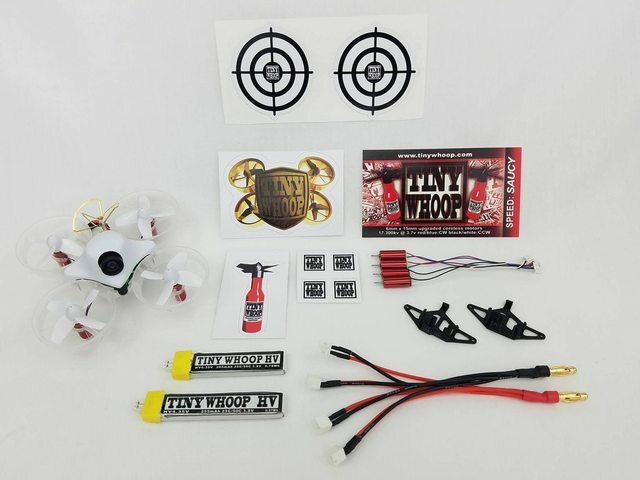 Now, Tiny Whoop actually sell their own variants; kits, prebuilts and parts - all available here - the only reason I've put them below the HorizonHobby link is that you will need to buy a transmitter and goggles separately, and for that reason it will be slightly more complex to get into (but like the rest you can just invest in a Spektrum DX6 and some goggles listed below, you will also need a battery charger but they sell one too!). The spec that Jesse sells and runs himself personally is by far the best performing brushed micro drone on the market, as well as actually being one of the more robust as their Tiny Whoop Racer (TWR) comes with the frame pre-strengthened in all of the normal weak points. Many of you will naturally just want to jump in the deep end and start with a drone that is capable of racing - and this is fine - but you are likely to progress slower (though you could potentially have more fun than some of the other options). There is also the safety aspect to consider with a proper racing drone like this - we all crash (even the pros), but there is a huge difference between crashing in a safe way and an unsafe way - it's easy to lose orientation of where you are flying, and more importantly where you and potentially other people are as well (but this isn't a lecture on safety). Another thing to consider is that while drones are actually relatively simple, you will need to learn basic soldering skills if you do not have those already, crashes usually involve changing the propellers for the most part - but it is possible to damage a motor or some of the electronics. With that aside, if you have friends already in the hobby that you can go and learn with, this is an absolute great way to get into it! Similar to above, the drone I would recommend does not actually come with an FPV screen or Goggles - so it is down to you to decide which route you want to take. Personally I am a fan of the Fatshark Dominator HD V3's, but these are also a £500/$550 set of goggles - that is a huge budget breaker for most, especially if you are just getting into the hobby. Recommended below are a set of $70 goggles that offer great functionality to the price and are a good compromise between using a screen, or using proper goggle optics. The drone above is know for it's robustness, but more importantly very low entry in terms of price. It features all of the normal features, software configurations and hardware you would expect on a top of the line racing drone, but at a fraction of the price. This is the ONLY racing drone I would consider at this price range, for pure racing. There are many others out there (Walkera, Blade etc etc), but they are nothing in comparison. There are also more expensive options out there, but I'm not sure personally that it is worth it for when you are just starting out. Hopefully this has given you a bit of an insight into which direction you should go, rather than just make it an even more difficult decision :). If you are wondering which I would personally recommend the most - it would have to be either the simulator route or a small fpv drone route - either of which are great at learning the ropes before you take the next step into a racing drone. It gives you the chance to learn the muscle memory you need before you step into the racing game, as well as keeping repairs to a minimum while you do that. I hope the choices above are of use to you, but if you have any questions please don't hesitate to ask them in the comments and I'll do my best to reply! As I mentioned above, there are some invaluable places that you can tap into if you want more information about anything specific, or need any recommendations on hardware, or even troubleshooting. Disclaimer: I have decided to add affiliate links where appropriate. These products are not suggested because of their affiliate links, but rather just help support me if you do choose to purchase through them. If you want the best price available I would recommend doing a Google search to find them.